Get ready for the most interesting journey of your life in this fun Match-3 adventure! Old detective Clark found a new home with his new friends - a family of snails, Bridget and Matthew. But one day Clark suddenly disappears, and the family doesn't know where he's gone! It seems that he has been taken away by the garden owners to a round-the-world trip! Bridget and Matthew has decided to catch up with the travelers and find Clark wherever he may be. 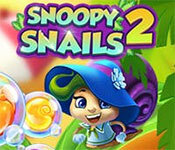 Click to start Snoopy Snails 2 Free Download. Sign-up to get informed when the Snoopy Snails 2 series has new game released with BD Studio Games' FREE bi-weekly newsletter.